You’ve probably read dozens of home improvement magazines, and have seen countless examples of the “perfect” kitchen lighting design. While there are many great ideas out there, until you have the fixture installed in your home, you won’t know whether or not it’s perfect for you. Every home is unique, as are its lighting needs. At Hortons in La Grange, we love helping customers find the ideal kitchen lights, and discovering how one or two fixtures can change their entire outlook on lighting. The issue that many homeowners run into is that they value the appeal of the kitchen over its functionality, or vice versa. When it comes to lighting, you want to strike a balance between appeal and functionality, creating a space that is inviting and still allows you to prep, cook, and clean with ease. You’ve most likely heard of the kitchen “work triangle” that exists between the refrigerator, stove, and sink (or dishwasher). This is great place to start with your lighting design. The fridge obviously has its own light, but once you move to the counter or stove area, it’s important that you’re able to see while prepping a meal. 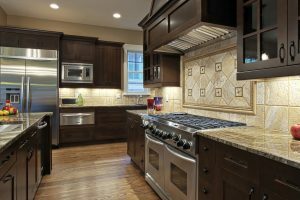 Under-cabinet lights can illuminate your countertops, as can lights in the hood above your stove. If you’re working in low light, you won’t be able to see how much salt you’ve added, or when there’s enough paprika! After you’re done prepping, and the meal is on the stove or in the oven, you want to clean dishes at the sink. Recessed lights above the sink area can help you see as you clean or load the dishwasher. The other area that’s important in your kitchen is the serving or dining area. If you have an island or a dining nook, placing pendants or semi-flush fixtures can help your family see what they’re eating, as well provide comfortable lighting for dinnertime conversation. Your island or nook may also be where you sit to sort through the day’s mail, or where the kids do their homework, and having the appropriate lighting makes these task much easier. One area where appeal trumps functionality is in the style of lights you choose. Our lighting experts can show you a variety of styles, but you’re the only one who knows what appeals to your personal tastes. You might be completely renovating your kitchen, or you might only be updating your lighting, but regardless of the circumstances, you’ll want fixtures that fit your tastes and provide the functionality you need. You’ll find every option in our showroom, including accent lighting and track lighting that can illuminate a piece of artwork or decor you’ve chosen for your kitchen. When updating your kitchen lighting, it’s important to remember that appeal and functionality can go hand-in-hand. If you pick lights that look good but don’t offer the functionality you need, you’re not going to have a very good time preparing meals or cleaning up after dinner. The opposite is also true – if your lights provide functionality but don’t set the right mood, nobody is going to want to spend time in the kitchen. Shop with Hortons today for your new kitchen lights!